Karna gives Indra his gift. Karna was born with an armor that made him invincible to any weapons. 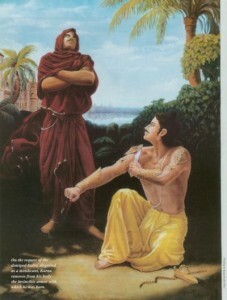 Indra, to help his son Arjuna, wanted to strip Karna of his natural defense. Indra exploited Karna’s magnanimity and asked for the armor as a gift. Karna agreed, but not without a trade. Listen to this exciting episode by clicking the player below. Your comments and feedbacks are always welcome.